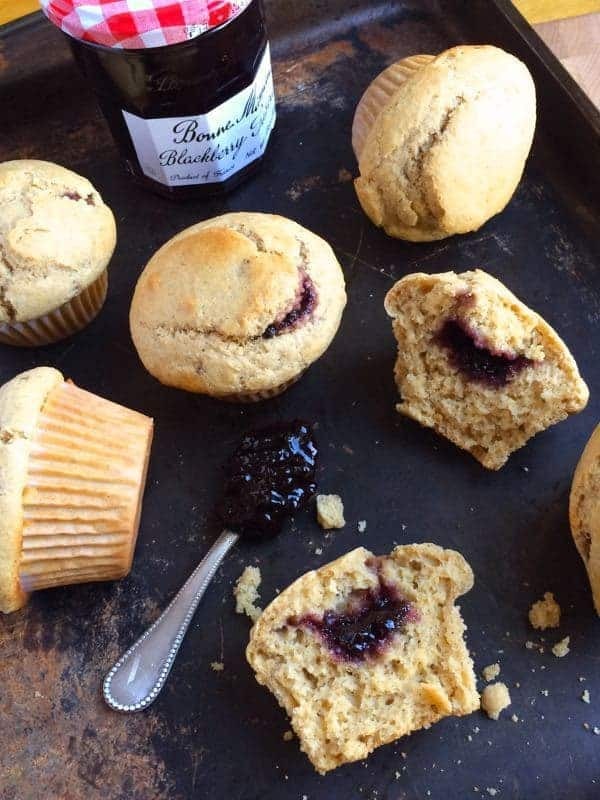 These light and fluffy whole grain muffins are packed with nutrients and filled with sweet and tangy blackberry preserves. I’m not sure how it happened but my 3 year old has turned into quite the little baker. And it absolutely melts my heart. So you better believe when my friends at Bonne Maman invited me to create a special recipe for Mother’s Day, I immediately enlisted my Sous Chef. With Mother’s Day around the corner, I can’t help but feel blessed to have little helpers in the kitchen. While they aren’t quite delivering me a hot breakfast in bed just yet, I am delighted to see their interest in cooking and baking growing every day. 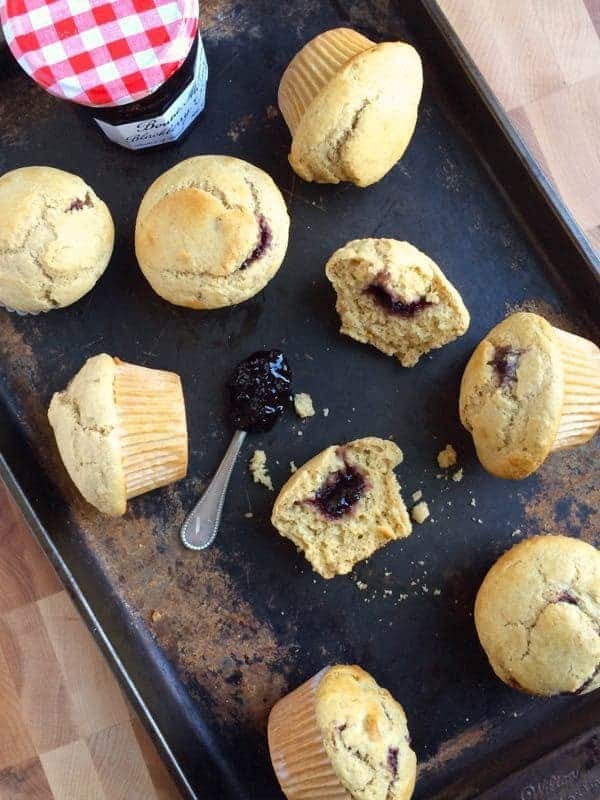 Whether you’re looking for a healthy make-ahead breakfast or afternoon snack, these Whole Grain Blackberry Jam Muffins are ideal for making with kids of all ages. They can help you whisk, measure and pour. Or eat the preserves with a spoon. Either way. And in the meantime, grab the kiddos and get in the kitchen. I hope you have as much fun baking these muffins as we did. Pre-heat oven to 400 degrees and line a muffin pan with 12 liners. In a medium bowl, whisk together dry ingredients: whole wheat pastry flour through salt; set aside. Add milk, coconut oil, eggs and vanilla to a bowl in a stand mixer and beat on low-medium speed until fluffy, 2-3 minutes. With the mixer on low-medium, slowly add the dry ingredients to the bowl. Mix until fully incorporated, 1-2 minutes - careful not to over mix. Remove from stand mixer and scrape down sides of bowl with a rubber spatula. Stir in chopped walnuts. 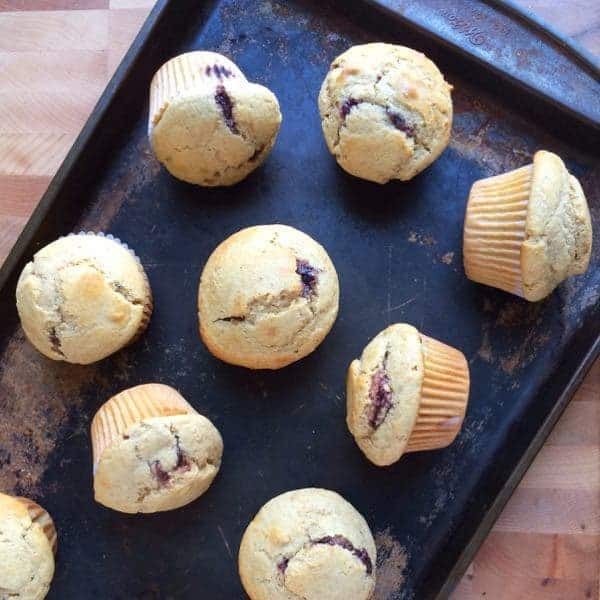 Using a medium metal scoop, fill each muffin tin half-way full with batter. Add one teaspoon blackberry preserves to the center of each tin then scoop the remaining batter on top of each muffin to cover the preserves. Bake until golden brown and toothpick comes out clear, 20-25 minutes. Cool in pan for 2 minutes then remove muffins and continue cooling on a cooling rack. Disclosure: Bonne Maman has compensated me for my time to develop this recipe. Thank you for supporting the brands that make The Lemon Bowl possible. All thoughts are my own. I had the same problem everyone else cited: the batter turned into a too-thick dough that couldn’t possibly become muffins. 3 cups of dry ingredients to 1/2 cup oil and 2 eggs simply is too much dry. Too bad… I wanted these to turn out. Hi Christina – I’m so sorry I just realized an ingredient was missing (milk!!) So sorry about that! I plan to make these this weekend. Is the nutrition calculated with the walnuts or without? Thanks! Thanks, I used Doves Farm fine plain wholemeal flour (says good for cakes and pastry) and Linwoods milled flax, sunflower, pumpkin, sesame seed and goji berry mix. Everything else the same. I did use UK-purchased measuring cups but I usually use those in baking, had read the difference is minimal doesn’t affect recipes? I was thinking as I slowly added the dry mix to the wet that it did seem too much dry. Thanks for your reply! Hi Amy – I’m wondering if it was the goji berry mix. Sounds a bit thick with the seeds and berries. Flax seed meal is the consistency of flour. Either way next tim try adding a little milk! Hi – I made these, mixing by hand, and the batter came out very thick, like a clay, could shape in my hands. I used all the called-for ingredients apart from flax seed used a ground flax seed and mixed seed combo. Any ideas where it went wrong? I improvised and made jam cups. Ok but quite hearty! Thanks. Hi Amy – Did you make any substitutions at all? Let me know so I can help brainstorm why the batter was thick. Mine was not thick at all. Hi there. I had the same problem as Amy. Really, really thick. I wonder if it should have read 1 1/2 cups of flour instead of 2 1/2 cups which would be more in line with other muffin recipes. Thanks. You know it worked for me but you could certainly try that next time!! 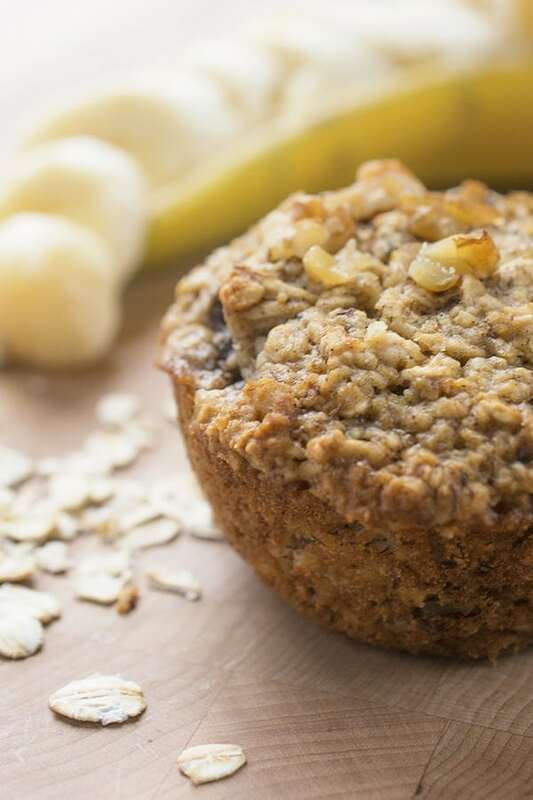 These look so delicious — a great on-the-go breakfast or satisfying snack. Will definitely have to try this recipe out with gluten-free flour! Let me know what you think friend! Hey, that’s my definition of “bake muffins” also!! But only if the jam in question is Bonne Maman. AKA the only jam worth eating. Aww what a sweet little helper! I remember when I was a kid I wanted to help my mom bake all the time. But really that just meant I just wanted to eat uncooked cookie dough and cake batter….haha. 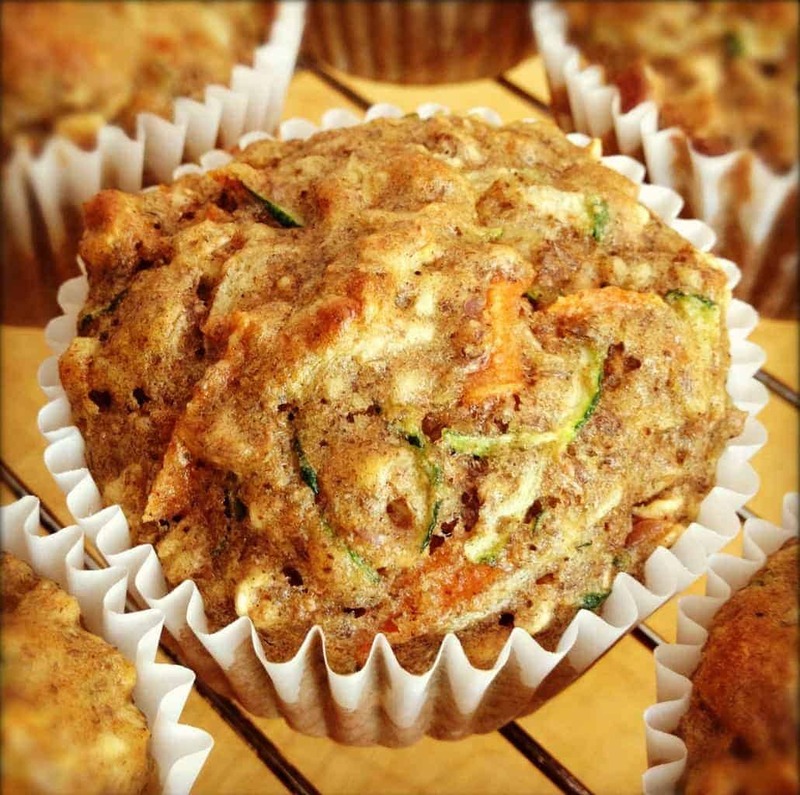 These muffins look great and totally perfect for a Mother’s Day breakfast. hahaha…that’s pretty much all he’s interested in too!! Cute kid. Cute post. Yummy muffins. 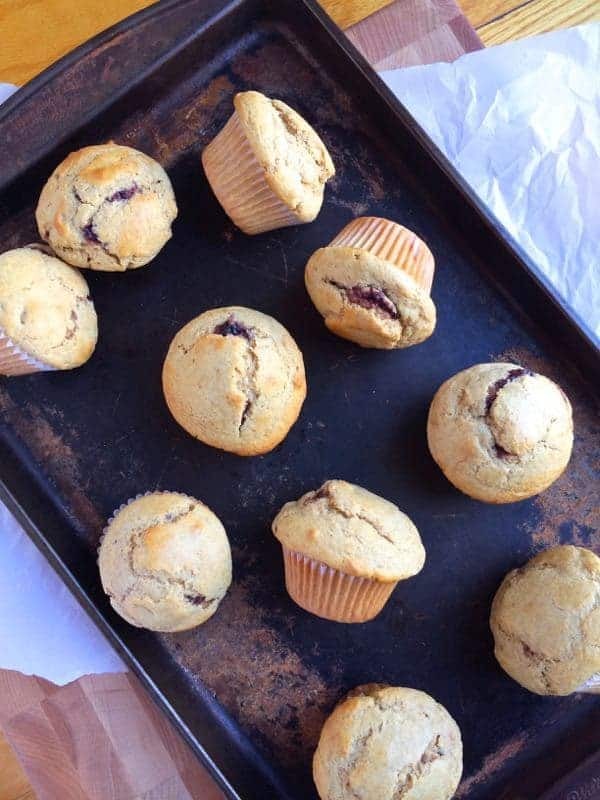 Muffins are such a treat for breakfast in my world—with my cup of coffee. Heaven! I absolutely love the blackberry filling in these. So beautiful! Aww thank you so much Laura! I hope you try them! Me too!! :) So fun to eat! Oh wow! These muffins look fantastic! Such a little cutie!!! 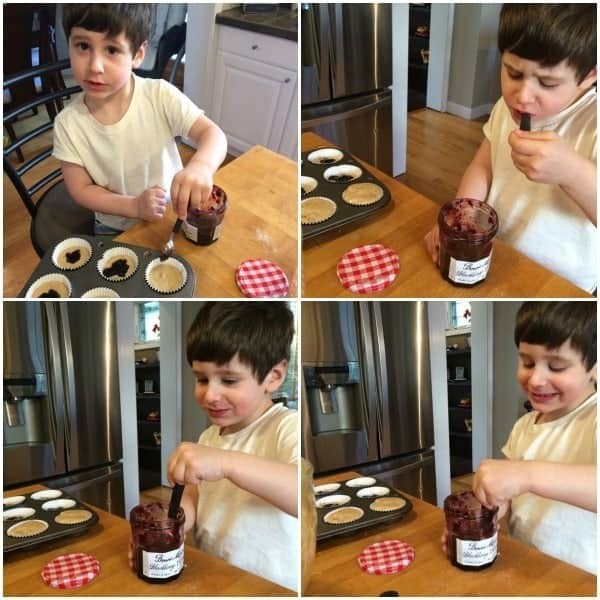 I probably would’ve done the same thing if my mom enlisted me to help bake as a 3-year-old… But she rarely baked, so I never got a chance to eat preserves straight from the jar. Oh darn! ;) These muffins look incredible though Liz! Hahaha that’s too funny!! Hopefully he will grow up to be a healthy baker like you! I love blackberry jam! I’ll have to try these when the blackberries are ripe! Oh I just love muffins!! With a surprise inside makes it even better!! I hope you try them Shawnna! These look wonderful, Liz! I would be happy as a clam if my kids made these for me on Mother’s Day. And really, who can blame Asher for eating the preserves straight from the jar? These muffins are gorgeous Liz! Oh man that challah sounds amazing!